Pink flowers are always subtle and classy. 12 pink roses brightly decorated with matching greenery. Send roses to over 100 countries worldwide with FloraQueen’s international flower delivery service. Traditionally representing grace and elegance, pink flower bouquets are also known to reflect sweetness and poetic romance, this makes them the perfect gift for a loved one, perhaps your wife or girlfriend on Valentine’s Day or for your anniversary! Light pink flowers are associated with admiration, while dark pink shows gratitude and appreciation. Pink roses are particularly popular, given their romantic connotations, but as you can see, there is a whole host of pink flower bouquets available. Whatever message it is that you want to convey you are sure to find just the right bouquet to help you say it. With our wide variety of bouquets, there is an option for every occasion. You will be able to express every form of love. 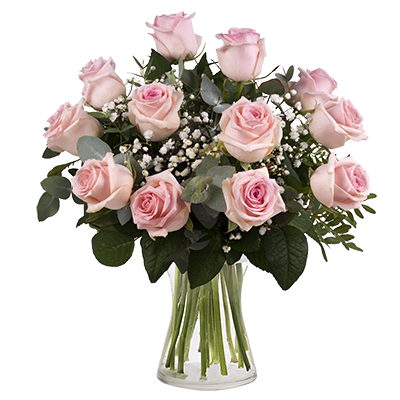 If you want to express this love even across seas and great distances, then a bouquet of pink flowers from FloraQueen is a great option. Our international delivery service will ensure they feel your love from wherever you are. Pink is a light, elegant and sweet colour. Pink flowers, in fact, have an important meaning, one that sometimes it is hard to convey in words. Pink is synonymous with affection for another person. Pink roses, for example, represent refinement and elegance and help convey sympathy, appreciation and friendship, whereas the pink tulip, indicates devotion and pure love. The pink peony communicates affection and nobility of soul. And finally, the pink gerbera, the bloom of youth and carefree attitude. Depending on what you want to express you can choose one of our bouquets of pink flowers that best fits your occasion and sentiments. 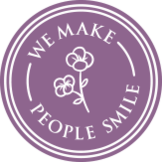 FloraQueen is proud to have a network of only the very best local florists in over 100 countries. Because of this, we can be sure that when you send pink flower bouquets abroad to your loved ones, your order is in safe hands. These experts florists will ensure that your pink flower delivery is made up of only the highest quality flowers and will make sure that your bouquet arrives with on-time international delivery to your loved one. Send flowers with our online florist and make sure that their special day will be remembered for a long time!